I made this shrimp for a party and it was very very tasty! It can be served as an appetizer or part of your main course. 1. Rinse shrimp and place in a large ziplock bag. 2. Put all the remaining ingredients in a bowl and mix together. 3. Set aside 1/2 cup of the marinade to use when ready to cook. 4. Pour the rest of the marinade in the bag and coat the shrimp. 5. 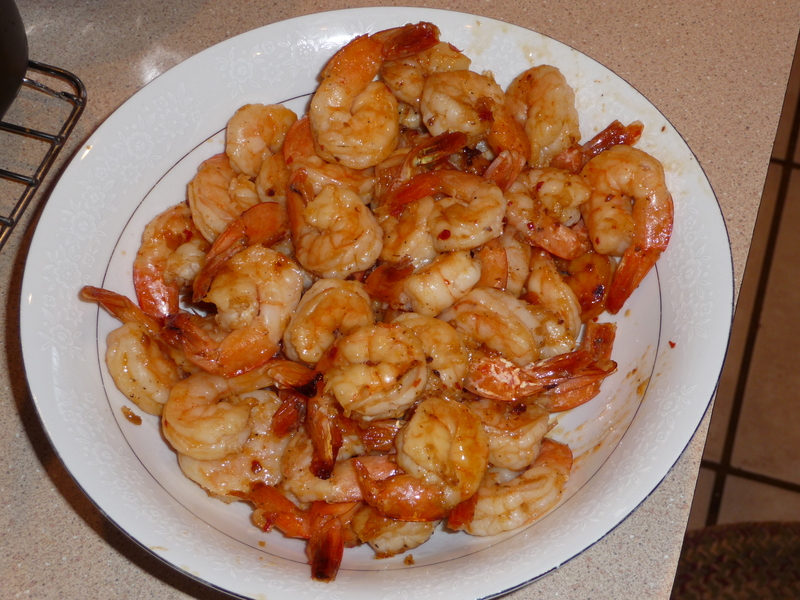 Put the bag of shrimp w/ marinade in a bowl/container to prevent from leaking. 6. Refrigerate for at least 24 hours, but no more than 48 hours. 7. When ready to cook, thread the shrimp onto the skewers and fire up the grill. *Some people recommend soaking bamboo skewers in water for 30 minutes before grilling to avoid them catching fire. I have read that it doesn’t really help, but use your own judgement. I didn’t soak my skewers, but I also lined the grill with foil. *I baked a few in the oven to try them out before I served them at a party. So if you wish to bake them instead of grilling, they will still turn out delicious. Bake at 350 for 10 minutes. 8. Put shrimp on the grill and pour the reserved marinade on top. 9. Cook the shrimp for a few minutes on each side until pink. *Be sure to keep an eye on them because shrimp cook very fast! 10. Once fully cooked, take off the grill and pull off the skewers to serve in a bowl. You can give each person an individual skewer if you prefer.